The proposal to regulate the fishing around the Illa de l’Aire has been brought to public notice in the past few days. GOB has made court declarations and wants to make public some of the considerations regarding this. Menorca suffers from over fishing. The scientists who study the sea point out that the level of conservation of the marine ecosystems around the island does not correspond with the presence of fauna. The use of precision technology in professional fishing, the thousands of recreational boats sailing during the whole of the summer, the underwater fishing and the shortage of effective monitoring, leave many species in the Menorcan sea over exploited. To confront this problem, the human pressure made on the use of the sea must be rationalized, with temporary closures, fishing limits and specially regulated areas. On this last matter, Menorca has the least protected marine area of the archipelago. It includes only the north Marine Reserve which adds up to about 5.000 hectares. In comparison, Mallorca has six protected marine areas with 42,000 hectares and the islands of Ibiza and Formentera sharing Es Freus, have 13,600 hectares. For these reasons, it is very necessary to increase the marine zones around Menorca with effective protection. It should be remembered that the Es Grau Nature Reserve has not yet been able to put into practice the management of the area of the sea and that the proposal to increase the zoning of the Reserve of the Biosphere of Menorca to include land and sea, though very interesting has, as yet, to be approved and it will not mean including immediate regulations, only possibly in the future. So that is how things are. The proposal for an immediate declaration for the protection of the sea around the Illa de l’Aire is very well received, even though discrepancies between certain collectives always come up just at the moment the regimen of use is being specified. In assessing the argument, must be the recognition that the increased area for protection is next to an environment remaining beyond these limits. Bearing in mind that the proposed delimitation for giving a certain protection for the sea found between the Illa de l’Aire and the coast of Menorca is only 592 hectares, we get the idea that the reserve would be much smaller than the whole of the protected area in the Reserve of the North (between Cala Barril and Es Pla de Mar). The delimitation proposal is up against many conditions because the Balearic Government can act only on interior waters, so, administratively, there is nothing they can do with the reality of the sea environment. 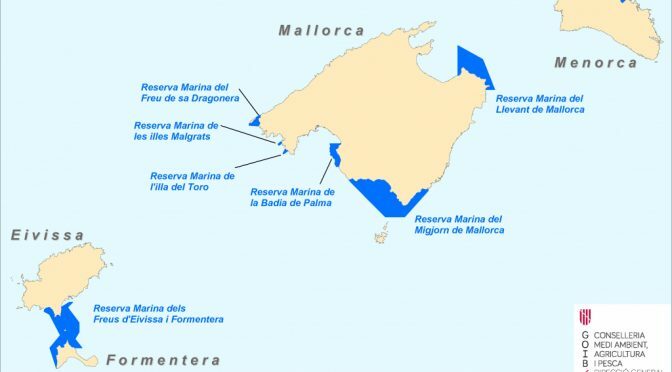 From the point of view of the existing ecosystems, the marine reserve should be much bigger, not just in the area to the north of the Illa de l’Aire, but this cannot be achieved as the Balearic Government has no jurisdiction over all the area. This needs to be taken into consideration when asking for regulations. The proposal which has been brought to public notice permits fishing in the western area (from Biniancolla). Referring to the area which is to the east (around Alcalfar and S’Algar) this is very close to the proposed reserve, so that going directly or turning to the north, there is access without restrictions. It would take longer leaving from Port Mahon than leaving from the marine reserve of the Illa de l’Aire. In the court declaration, GOB has asked that a much stricter regulation be made for tourist underwater activities done near some caves that, as noted by scientific studies, are environmentally highly fragile. They also ask for the decrease of some professional fishing and the prohibition (in the area round the Illa de l’Aire and the Reserve of the North) of certain types of fishing competitions.